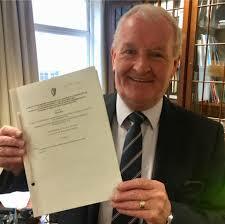 Sligo-Leitrim TD Tony McLoughlin is retiring from the Dail at the next election. Fine Gael TD Tony McLoughlin. The Fine Gael deputy and Assistant Party Whip, who is 69, announced that he would not be putting his name forward as a candidate at the next election. He said: “After almost 45 years in public office, I believe that the time is now right for me to begin to step away from politics in order to spend more time with my family and my wonderful grandchildren whose support down through the years has been incredible. McLoughlin began his career in politics when he was elected to Sligo County Council in 1976, a body on which he served as chairman on two occasions. He was elected to Sligo Borough Council in 1979, succeeding his father, Pat on the authority. He served four separate terms as Mayor of Sligo. “Throughout my career, both locally and on national issues, I have always tried my very best, always fought for what was right for my constituents and always did so in a respectful manner,” he said. “The large amounts of support I have received from the general public at election time has been one of the proudest aspects of my career. On that basis, I want to thank the people of Sligo and Leitrim. I am honoured to have served you. McLoughlin was earlier today warmly applauded for his work towards outlawing onshore fracking. The Dail backed his historic private member’s Bill to prohibit hydraulic fracturing in Ireland last year, following which it was signed into law by President Michael D. Higgins.